Block Chess is one of our custom chess product that unique and looks different than ordinary chess pieces. This kind of chess set is complete as ordinary chess set, consist of one King, one Queen, two bishops, two knights, two bishops, and 8 pawns. It made of giant wood block and carved in simple way. The way to differ one piece to the others is by paying attention to the head of the pieces. But over all, it looks simple wood block for chess game use. This block chess is dedicated for you who fond of simplicity. Very simple and different with another decorative chess. Those block chess pieces are made of Teak wood and carved simple by our professional craftsman. The product is very durable for outdoor and indoor use. 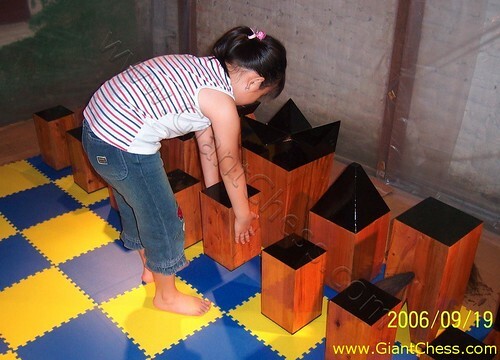 You can play the block chess game at your garden or backyard without worry about the damaged because it made of the strongest wood in the world, Teak wood.